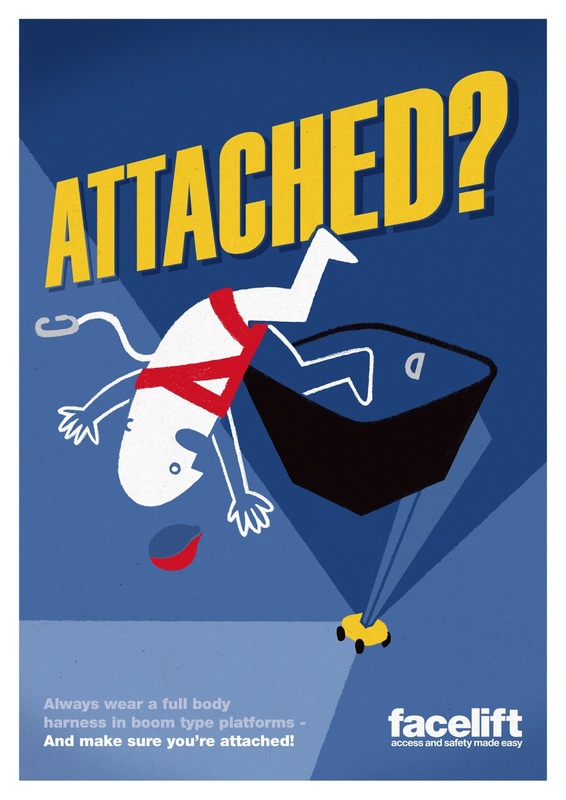 My latest work is a set of Health and Safety posters for platform hire company Facelift! Facelift offers a wide range of Cherry Pickers, Scissor Lifts and Truck Mounted Platforms, and the safety of it's customers is a key consideration; I've been commissioned to create a set of posters that clearly communicates key issues facing those working at height, including attaching the harness to the cage, wearing the right gear on site, and checking the quality of the ground beneath the equipment. "The number of serious accidents caused by not following the correct health and safety procedures shows that many people still need to be reminded of what steps they need to follow to stay safe on site." Inspired by vintage RoSPA posters, my bold, simple figure is placed in precarious situations to grab the immediate attention of the audience, with a headline that directly interacts, with it's clear and simple question. Perspective not only adds a sense of drama overall, but also helps to create a strong graphic look and feel for the range, using Facelift's brand colours. 'Attached' is the first of 12 to be released monthly this year. Nice work, I really like the composition. I have to say though, your guy reminds me of Sean Connery's character from Zardoz. It's not a bad thing, just a fun coincidence. I wasn't familiar with Zardoz - but having just Googled him, it's a vision I'll never forget! Too funny!